Speaking of New England, there were a lot of choices for this representative, being a region of five states (yes, I said five…I do not count Connecticut as part of New England…sorry Huskies). 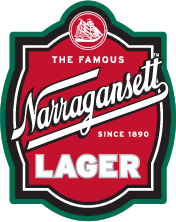 With that in mind, I skipped over the easy picks of Sam and Harpoon, and went with Narragansett, one of the oldest breweries in the country (1888). 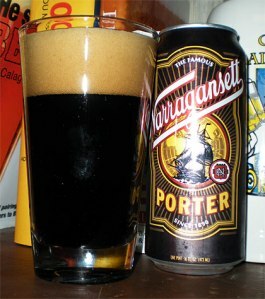 Narragansett gets a bad rap for their beers, but aside from their flagship, they have been producing some solid, quality brews. One of these happens to be their Porter. Poured from a can into a tumbler pint, the beer is jet black, with a densely packed, foamy, thick, light tan-colored head that stands at a strong inch and a half. This head doesn’t appear to be going anywhere anytime soon. Impressive look to it. The nose is a dry mocha and dark chocolate blend, and very inviting. The beer is insanely smooth and creamy in mouth, and it has a rich, velvety chocolate milk flavor initially that is ridiculously easy to drink. Do a drink per score New England fans, and watch how fast the cans stack up. The tastes continue to progress, with a hint of roast coffee bitter and a hazelnut highlight. Great flavors on a smooth, round body, with a decent cling left behind as you consume. The aftertaste is milk chocolate, and it lingers nicely behind in your mouth, with a nonintrusive finish that has some staying power. It sticks around, urging you on in your journey. Very easy to drink, which could get dangerous real fast, just like the Pats’ offense. With nothing at all to do with the beers I have written about, I will now go on the record to say that I am predicting the San Francisco 49ers and the New England Patriots in this year’s SuperBowl, which will be great, as most of my friends are Pats fans. It should make it interesting, to say the least.